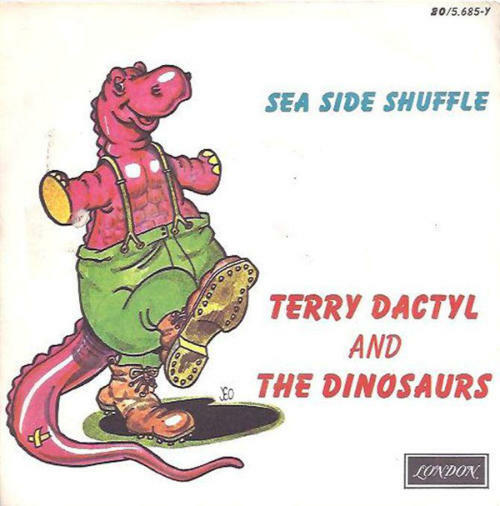 Terry Dactyl On the subject of this, J Edward Oliver wrote: The Seaside Shuffle ad was one of a series of handouts I did for UK Records, to be sent to Radio DJs to try and persuade them to play the record. 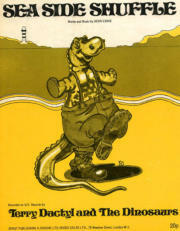 This was one of the most successful. A huge poster of it was displayed on the wall of UK Records. 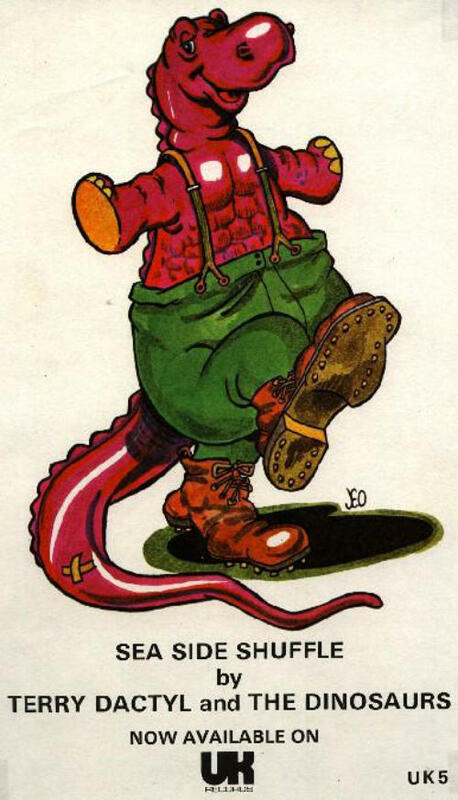 However I didn't draw that - it was a copy of my drawing that I think must have been done in France: I notice it was signed "D'aprés JEO" - "After JEO"). 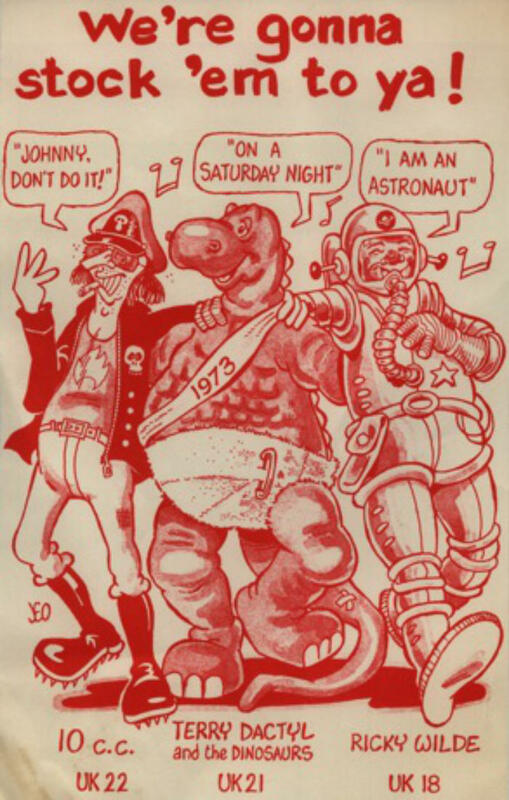 I drew the original in a huge rush: I think it was on my thirtieth birthday and I was in a hurry to join my friends in the pub. 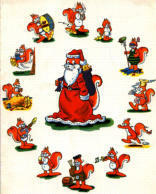 I seem to remember I received £15 for the handout. 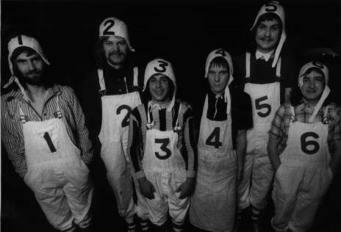 I've always been underpaid. 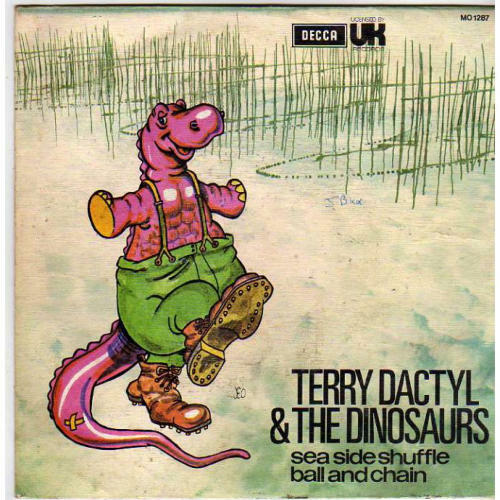 Terry Dactyl and the Dinosaurs included Jona Lewie. 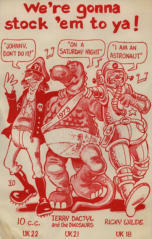 They later became Brett Marvin and the Thunderbolts. 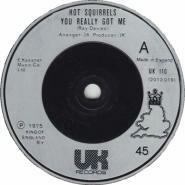 Hot Squirrels J Edward Oliver wrote: Here is another card from UK Records (December 1975). 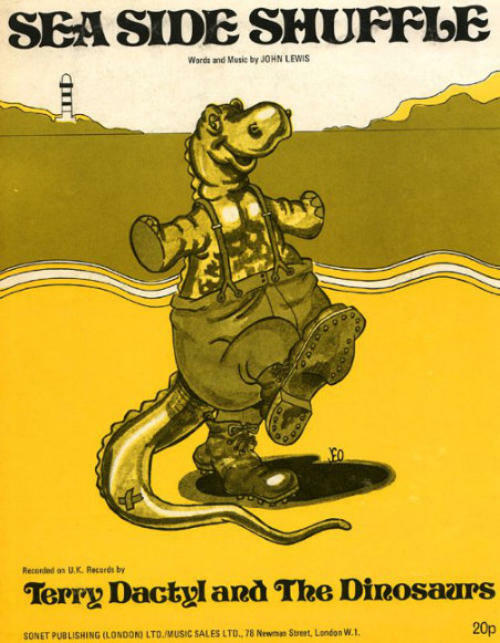 Personally, I'm not very keen on it. 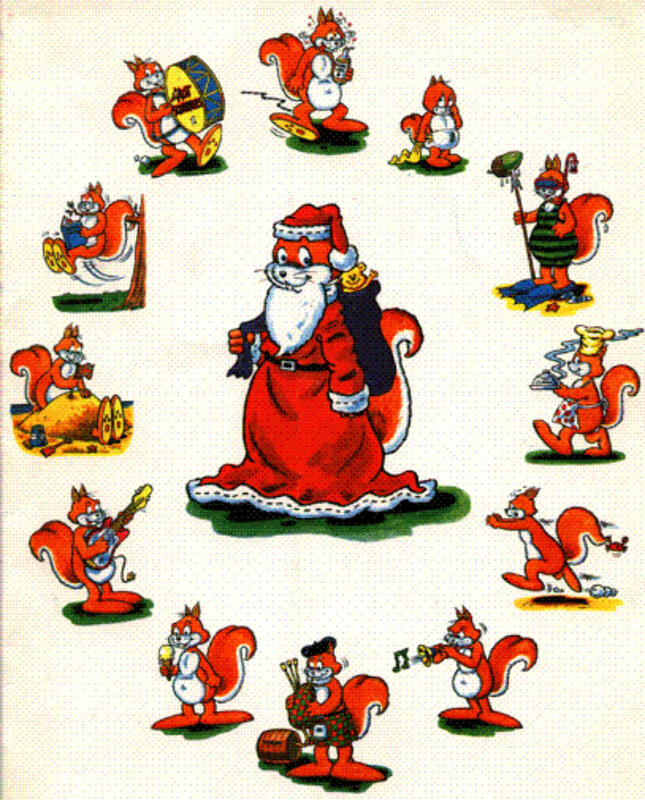 As far as I can remember, they got me to draw a set of cartoons to promote the band "Hot Squirrels", then decided to lump the pictures together as their Christmas card. 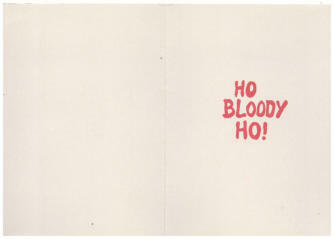 Inside, it just says "Merry Christmas from all at UK records." 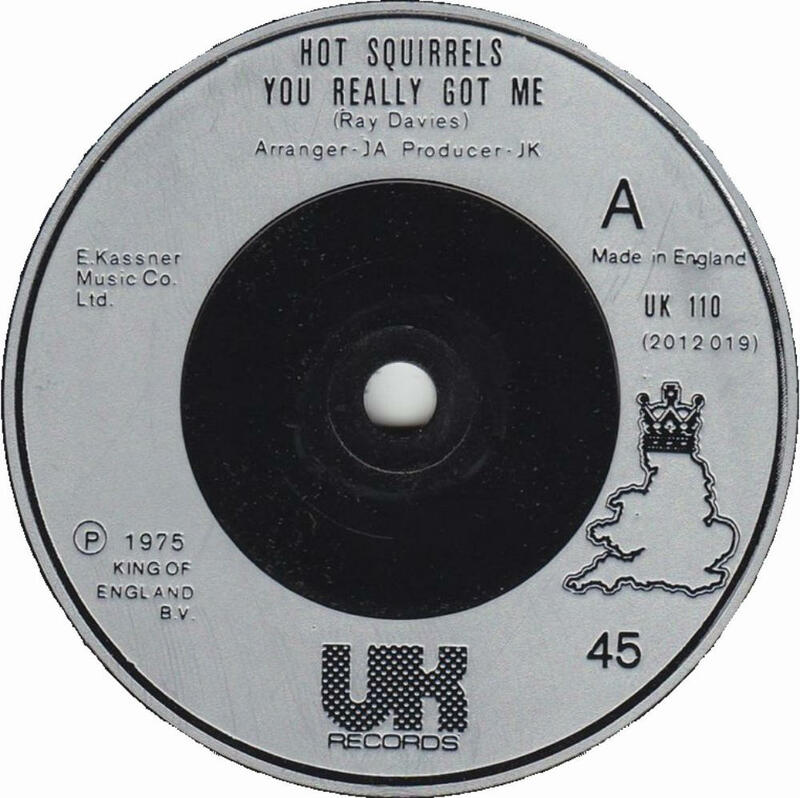 The only known record by Jonathan King's band is: You Really Got Me (Ray Davies) b/w Nuts (Jonathan King) (1975) UK110 (right). 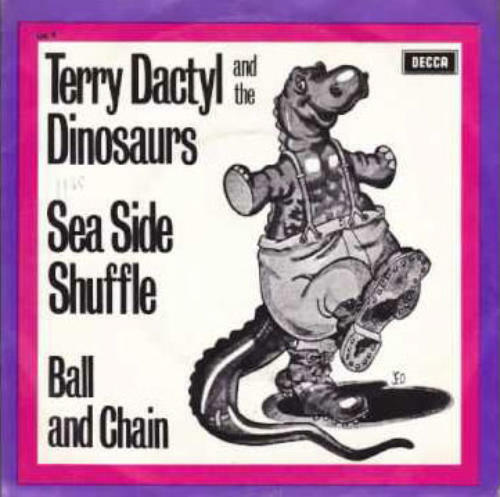 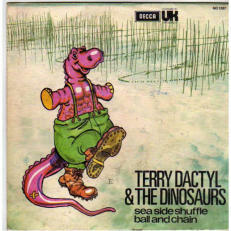 Here is another item from the JEO work for UK records, another incarnation of the Terry Dactyl dinosaur, on a handout to DJs (probably December 1972).